PWe all love to spend time in our patio no matter what season it is. But cold weather makes the place inconvenient due to fall in temperature. And not to mention, but a single jacket is not enough to keep you warm during chilly winter days. So it becomes necessary to get an outdoor patio heater. And here we are with our 10 best outdoor propane patio heaters to keep you warm while you spend your valuable time with your loved ones. The reason why propane or gas patio heater is widely used in patio or decks is because it provides heat fast. Also it covers good area in short span of time and effectively warms up space. Another major reason is, propane tank is easy to replace. Apart from that, they are portable which means you can move your propane patio heater wherever you wish. 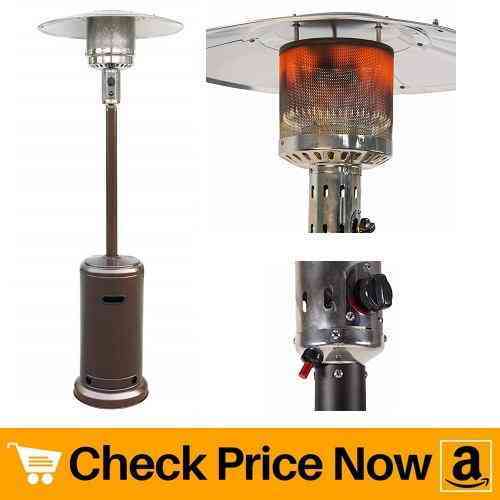 Now let us move towards our best outdoor propane patio heater reviews to help you buy your perfect product. 12.1 1. Can i use a propane patio heater in my garage? 12.2 2. How to light a propane patio heater? 12.3 3. 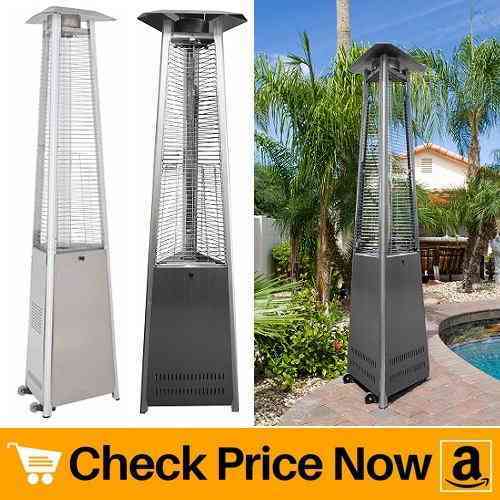 Infrared patio heater vs propane? 12.4 4. How long does a patio heater propane tank last? We start our reviews with fire sense propane patio heater. 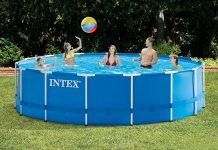 Its wide heating range of up to 18 feet in diameter covers large area. In addition, its heavy duty stainless steel burners along with double-mantle heating grid makes the product durable. Also the unpainted stainless steel body easily matches your patio and makes it look beautiful. This 46000 btu propane patio heater evenly throws out warm air, making your patio cozy. Plus the aluminium reflector hood at the top ensures even airflow in all directions. It comprises of an electric ignition system, basically a push button which helps to start the device easily. This ignition run using battery which you need to buy separately. Overall, this outdoor patio heater is quite heavy. But no need to worry, as it contains wheels in the bottom for ease of movement. A standard 20 lb tank is all you need in order to run this product. Thus, making it one of the best propane patio heater for both commercial and residential use. Spending time outdoor becomes more fun if the place is warm and quiet. So next on our best outdoor propane patio heaters list we have another tall unit. 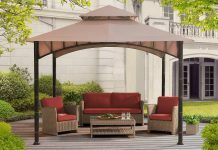 First of all, hammered bronze finish undoubtedly enhances beauty of your patio. Further, 48000 btu is enough to heat up quite large space. The electronic ignition catches fire simply by pushing the button. Besides that, you can set the intensity of heat by manually adjusting the knob. For safety purpose, this unit features anti-tilt design. This in turn, reduce chances of accidental tilting of the device. Or by chance, if the heater is knocked over, it automatically shuts down. Thus, making product more safe and reliable. This budget-friendly heater runs on a standard 20 lb propane tank. Dyna-Glo DGPH201BR 48000 BTU also have wheels at bottom for easy mobility. Therefore, you can easily move the device indoor during off-season and bring it out during chilly days. 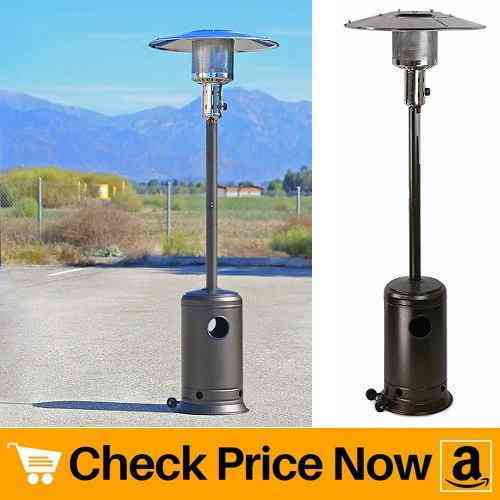 This outdoor propane patio heater provides all basics features of an ideal heater under budget. If you want a heater that effectively heats up small to medium size patio space then this 46000 btu propane patio heater does the job just right. It is powerful enough to keep you warm for long period of time. Piezo ignition system eases start of the unit. Therefore, you just need to push red button once to start the device. Further, adjustable temperature control knob allows you to manipulate heating intensity of the unit. It also features a shut-off tilt valve which automatically shuts down the device in case it gets tipped over. Cost of this item is not too high. And similar to other models, it also have wheels at base to easily move the unit. Plus the stainless steel construction is strong and sturdy which can last for years. Next on our list we have CSA certified propane patio heater. If you want a stylish looking product which makes your patio look beautiful then this is perfect. Apart from its attractive look, it emits 48000 BTU of heat. Thus, provides heat to a wide area. Just like majority of the models, this unit also have easy ignition start. Also the variable heat-control knob allows you to set the temperature from low to high or vice versa. And in order to increase safety of the device, it features anti-tilt automatic shut-off mechanism. Therefore, which prevents hazardous accidental events in case the unit tilts down due to sudden breeze. The only flaw we find in this unit is, bottom section of the neck and top part does not fit well. There are only two screws to hold both the parts together, which we think is responsible for non-parallel alignment. This is not a major flaw as you can barely notice. Or else, this is one of the best outdoor propane patio heater. Now this unit is really a head-turner. This az patio heater have perfect design along with great heating capacity. It is 89-inch tall and comprises of two piece quartz glass tube surrounded with sturdy metal frame. This in turn, reduces possibility of tipping over. Thus, makes the unit strong and reliable. Here the variable-heat knob and ignition start button are present inside the bottom cover. Besides that, it runs on a standard 20 lb propane tank which can last up to 10 hours on high. And it have wheels at the end for easy mobility. Assembly of this heater requires a lot of time as it comes with many parts. It might take 30 minutes to an hour if you are assembling the unit all by yourself. Apart from it, the parts are easily available in case they get damage. Moving ahead, we have a simple, easy to use outdoor propane patio heater. Main reason to include it in our list is its perfect finish and use of quality materials. Though its heat output is 41000 btu, the wide reflector at the top evenly spreads heat in all directions. Unlike other models, this one does not have base at the end to fill sand or water. Therefore, you compulsorily need to anchor it on the ground or else it will tilt due to heavy winds. Apart from that, all other features such as start up, setting temperature, etc is easy to perform. Also it requires very less time to make the product stand up. It runs on a 20 lb propane tank which is easily available. In addition, placing and removal of tank is not hard at all. You can use the heater continuously for 10 hours with a full 20 lb tank. Hence, which is enough to keep you warm all night. Spending time outdoors becomes more convenient if the temperature is warm and cozy. But the fun doubles when you have a tall propane patio heater with table and wheels. So here we present you a outdoor heater with small table which will look great in your patio. In addition, this little table have enough space to place set of wine glasses. Moreover, you can adjust the height of the table without need of any tools. Heat output of 41000 btu is enough to keep you warm if you’re sitting near to the unit. Besides that, this product is easy to assemble. It requires 30 minutes at most to put all the parts together. After that, all you need to do is, purchase a standard propane tank, place it in the unit, make connection and start the unit. What we love the most about this outdoor propane heater is its minimal noise generation. This heater works quietly on low and medium setting. Even on high setting, the sound of the gas is barely audible. Thus, enjoy a warm and peaceful evening with your loved ones. Next on our list is a powerful outdoor propane patio heater. 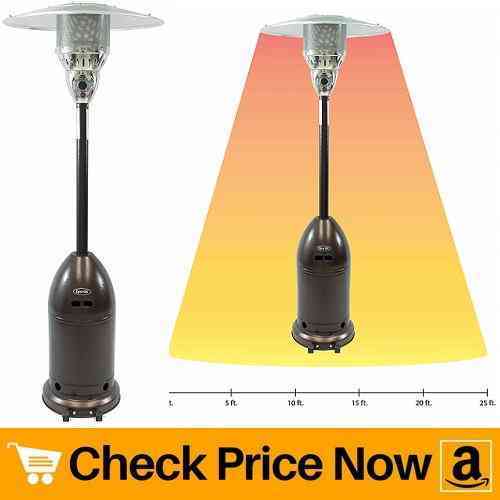 Its great performance and low cost is the main reason to include it in our best propane patio heaters list. 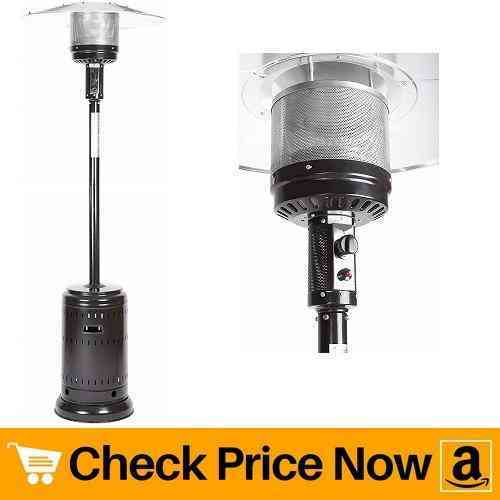 If you’re buying patio heater for the first time then in our opinion, this is one of the best model. First of all, the average heat output of this unit is 47000 btu’s. At maximum, it can reach up to 48000 btu. Therefore, this much amount of heat can warm up relatively large space without need to stay too close to heater. Plus the unit heats up fast and aluminium reflector hood is responsible to spread warm air in all directions. 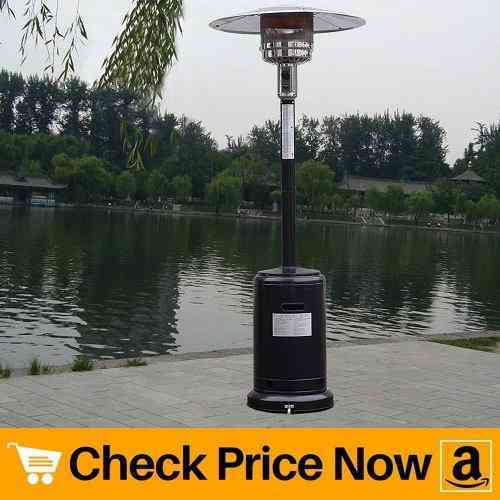 So conclusively, it offers all features of an ideal outdoor patio heater. 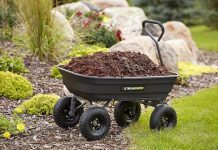 It is easy to start, safe to use, includes wheels at base and have an auto shut-off feature. Thus, all you need to do is, assemble all the parts, start the unit and enjoy warm temperature. 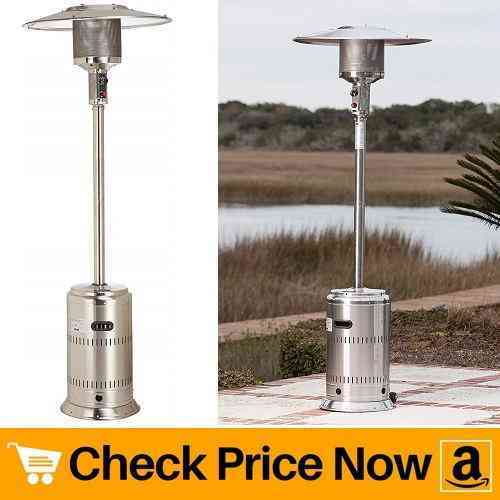 If you’re looking for a beautiful outdoor propane patio heater for your backyard and patio then here’s a perfect model. Its unique pyramid flame structure gives a beautiful look and creates a cozy environment. And when you turn on the unit, you get to see dancing flame of fire. Thus, which produce brilliant light which is quite pleasant to look at. Construction of this model is strong and sturdy. 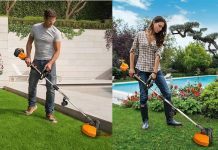 In addition, it weather-resistant parts have rust, fade and corrosion-resistant finish. Therefore, which means this propane heater can withstand extreme climate conditions such as extreme sun, salt air, etc. Hence, making it worth the price. Regarding safety of the heater, it have protective mesh surrounding the ceramic-glass. Further, it comprises of a pilot light for safe start and shut-down. It also complies with ANSI, CE, CSA standards and specifications. Meaning, the product is reliable and safe to use. 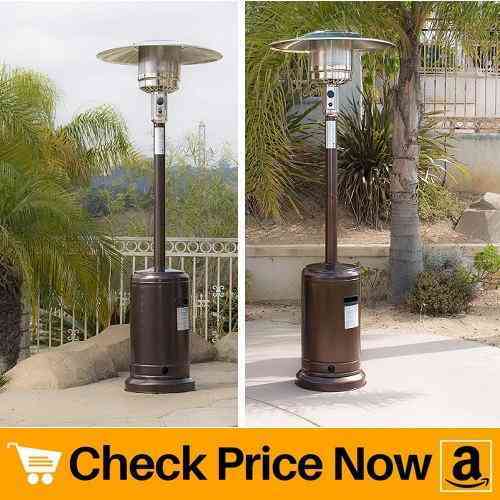 Last on our best outdoor propane patio heater reviews we have a cheap patio heater. Just like majority of heaters on the list, this unit also have easy ignition start. Moreover, it comprises of temperature control knob which allows you to change intensity of heat coming out from top. And lastly, the reflector hood at top evenly spreads warm air in all directions. Speaking about its construction, as the product is cheap, it compromises in quality of materials. No doubt, it have stainless steel body but you need to take utmost care of unit to avoid any dents. Otherwise, it have beautiful appearance and assembly of the parts is quite easy. You can easily set all parts by yourself in under 30 minutes. This outdoor propane heater have heat output of 41000 btu. This much amount of heat can warm up persons near to the heater. Besides that, it contains wheels at the bottom to move the device easily. Thus, keep the unit indoors when not in use and enjoy the warmth during chilly weather. 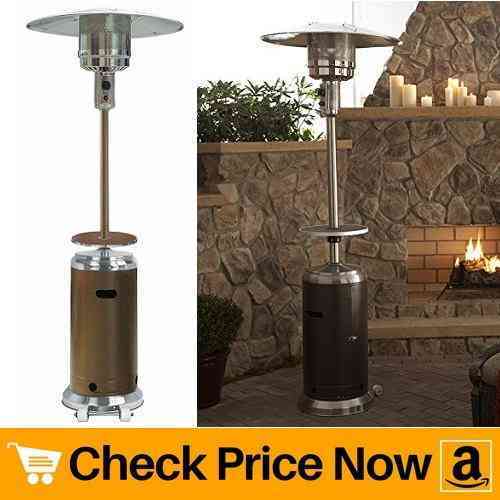 So now you have list of best outdoor propane heaters, let us focus on patio heater safety tips. And not to mention, safety is very much important when dealing with fire. So go through below tips to avoid any accidental damage. Never move patio heater while it is on. Propane heaters are meant for outdoor use only. Never use them indoors as they release carbon monoxide which causes suffocation. Double check the connection of propane tank. Make sure the gas does not leak. Keep propane patio heaters away from flammable materials. Add proper weights at base to ensure the product stays firm. Do not place heaters too close to wall. Maintain a safe distance between them. Ask your children to stay away from unit. Also make sure they do not touch them while they are on. 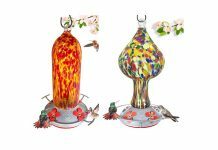 They might get burn as outer surface of heaters are usually hot. 1. Can i use a propane patio heater in my garage? As we already mentioned in safety tips, propane heaters releases carbon monoxide. This gas is toxic and causes suffocation. So in our opinion, never make use of propane patio heater in garage. As the garage space does not have proper ventilation, the toxic substance cannot escape easily. This in turn, makes the air inside the garage harmful to inhale. So always use a propane heater outdoors or in an area having good ventilation. 2. 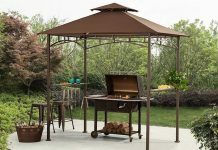 How to light a propane patio heater? Follow the below given steps to properly light a propane patio heater. First of all, properly attach the regulator to the tank using your hand only. Now, turn on the propane tank fully. Next, turn the knob in pilot position, press it down and hold it for 45-60 seconds. Press the red ignition button to start the unit. Hold the knob in pilot position for 10 seconds more before letting it go. Now you can adjust the heat intensity and enjoy warmth coming out from the heater. 3. 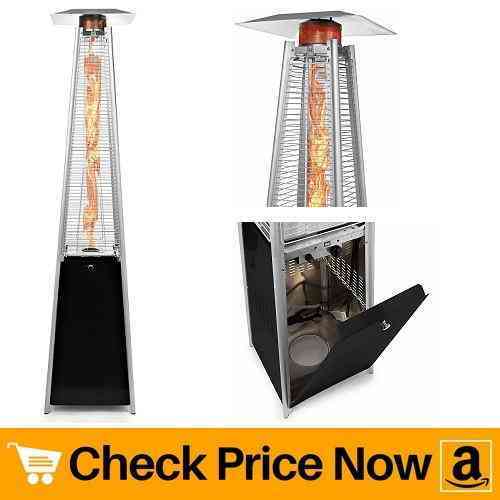 Infrared patio heater vs propane? People have a lot of confusion about what kind of heater is best suitable for their patio. And generally, they get a hard time choosing between infrared patio heater and propane patio heater. Both of them holds their advantages and disadvantages. Below points will let you know how propane patio heater is better than infrared when it comes to outdoor heating. Flexible: Propane heaters are more flexible as compared to infrared ones. You can easily move them from one place to another without any hassle. Whereas, in the case of infrared models, they are not much flexible. Heating: When it comes to heating, propane units never fails to provide you warmth. They heat up the surrounding air and circulates evenly in all directions. But in the case of infrared heaters, they heat up all the things similar to that of sun’s ray. Also propane units heats up faster than electric ones. Power Source: Propane patio heaters generally requires a 20 lb propane tank to make the unit run. This is one of the major factor which contributes in its flexibility. While infrared heaters require a proper connection and continuous power supply in order to supply heat constantly. Cost: Initial price of propane heaters are little bit more than electric ones. But the running cost of propane models are less than that of infrared. 4. How long does a patio heater propane tank last? Generally, a standard 20 lb propane tank lasts for 10 hours if it runs on high setting. The average running cost of a unit that generates heat output of 40000 btu ranges from $1.60-$2 per hour. Therefore, the running cost is dependent upon the heat output of the unit and varies according to it.